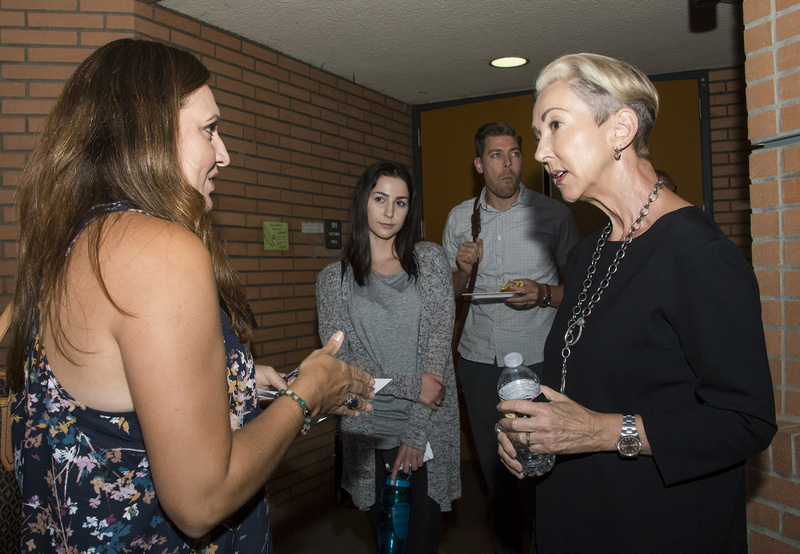 Dermalogica founder Jane Wurwand gave advice to budding entrepreneurs at a lecture held on the CSUN campus. Photo by David J. Hawkins. Jane Wurwand stayed for more than an hour after her lecture to talk personally with CSUN students. Photo by David J. Hawkins. “Don’t do what everyone else is doing — do what they’re not doing” was the message that innovative entrepreneur Jane Wurwand shared with business students and budding entrepreneurs during her recent lecture at California State University, Northridge. 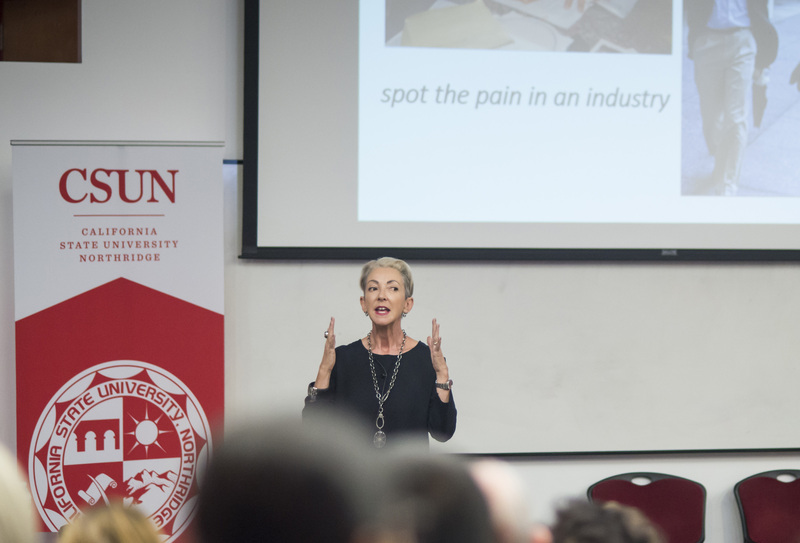 Wurwand, founder of the skincare company Dermalogica and The International Dermal Institute, shared her story during her speech, “Changing the World with Our Bare Hands,” on Sept. 27 at CSUN’s Charles H. Noski Auditorium. Wurwand shared her background with the audience, including her first job in a salon at age 13, her father’s untimely death and her mother’s work ethic in raising her and her siblings alone. Wurwand, who is also a U.S. Presidential Ambassador for Global Entrepreneurship, said she believes that determination and follow-through are essential for entrepreneurs. “You need to figure out the opportunity in any field — you need to spot the pain,” she said. Wurwand and her husband, Raymond, emigrated from the United Kingdom to the United States in 1983, and as Wurwand worked as an esthetician, the “pain” she quickly spotted in salons was a lack of skincare training beyond the basic skill set needed for a cosmetology/esthetics license. To help fill that void, Wurwand and her husband opened The International Dermal Institute in 1983 with just 17 students, creating a business that allowed estheticians with licenses to upgrade their skills so they could build their own salon businesses. The institute received an excellent response, especially from entrepreneurial-minded women. Wurwand soon discovered another source of “pain,” she said: Professional-level domestic products weren’t available. “There were brands in the drugstore and department store, but there wasn’t anything for skincare in the salon that wasn’t imported and expensive,” Wurwand said. This realization led Wurwand to find a cosmetic chemist to develop her institute’s own skincare products free of common skin irritants, including lanolin, SD alcohol, mineral oil, and artificial colors and fragrances. Dermalogica officially launched in 1986, earning an astonishing $1 million in its first full year. By 2014, Dermalogica had earned nearly $240 million, and the brand was sold to Unilever in 2015. At CSUN, Wurwand challenged her audience to pursue their dreams, regardless of their backgrounds. Alumna Ellen Nathan ’09 (Education), who now owns her own licensed hearing aid dispensary, found inspiration in Wurwand’s advice. “I know of a huge gap in my industry, and after tonight, I think I’m going to pursue the opportunity I see,” she said. ← CSUN Professor Explores the Question: Is Akkermansia a Next-Generation Probiotic?